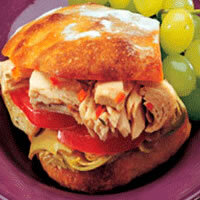 Artichoke hearts add zesty appeal to the traditional tuna salad sandwich. Drain albacore tuna, set aside. Drain artichokes, reserving marinade. Cut artichokes into quarters and place over bottom half of each roll. Top with tomato and albacore. Drizzle with reserved artichoke marinade. Top with roll.